Cast: Akshay Kumar, Annu Kapoor, Huma Qureshi, Saurabh Shukla & Manav Kaul. Do not compare Part 2 with Part 1, otherwise Meri jaisi haalat ho jaayegi !! 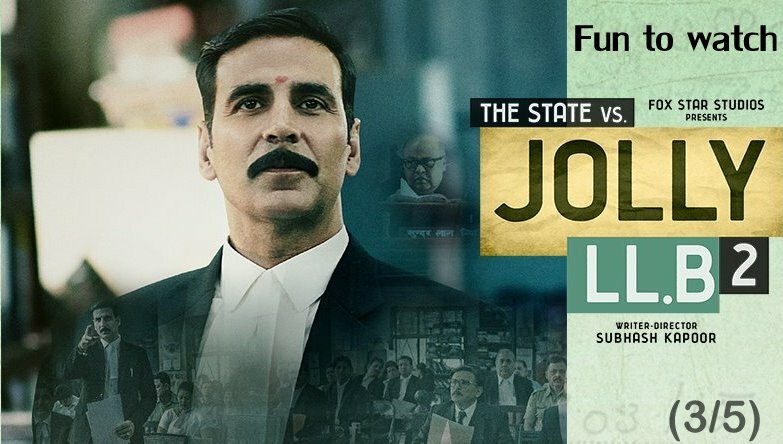 Yes I really enjoyed Jolly LLB part one and part 2 is not as good as preque. The best part of the film is Saurabh Shukla as Sunder Lal Tripathi. Na koi surprise mila – na suspense, Forced Romance, Unnecessary songs ki wajah se thoda bahot main pak gai thi movie mei but Jab bhi Court room drama shuru hota tha, mere paise vasool ho jaate the. 3.5 crore pending case ke saamne Sirf 21,000 judge hone ke baad bhi Humara bharosa system pe kyu hai wo baat kaafi achche se Saurabh Shukla samjaate hai movie mei. Akki fans gonna love him in this movie. Some liners and msgs are really nice of the film which is why i would like to recommend this film to the audience. Sharing my quick review. Fun Part: court room scenes. Hilarious part: Sundar Lal Tripathi ni entry & The way one of the assistant explained Vakeel ke Skim/packages. Watchable or Not: Undoubtedly Yes. Its a fun film to watch for Akshay Kumar, Saurabh Shukla & one liners.